The Navy added a second provider of contractor-owned and operated small unmanned aerial systems (UAS) for its sea-based missions, signing an indefinite delivery/indefinite quantity (IDIQ) contract with Textron for use of the company’s Aerosonde unmanned system. Textron joins Insitu, which operates the ScanEagle small UAS, in competing for ship-based surveillance work as the Navy’s requirement continues to grow. As one of two contractors who can compete for ship-based work and one of four competing for land-based work for the military, Textron will be bidding on task orders under the IDIQ contract worth up to $1.73 billion over five years, David Phillips, Textron Systems Vice President of Small/Medium Endurance Unmanned Aircraft Systems, explained to reporters today in a teleconference. Phillips said the Navy was more specific in this contract award compared to the last one in 2012, stipulating that UAS operating on ships must use the same aviation fuel already aboard Navy ships rather than using their own fuel or battery-powered systems. The system must also stay within a tight footprint on the ship and be completely roll-on/roll-off, meaning no modifications can be made to the ship and the system must be completely removed from the ship’s deck when not in use. Importantly, compared to the 2012 contract, Phillips said the Navy is looking for much more flexibility in bringing in new payloads. “You better be able to support more than you supported last time in terms of weight and power,” he said was the general theme from the Navy this time around, with the service asking for at least 2.5 pounds of weight for the payloads. “They didn’t ask for that before. And [U.S. Special Operations Command] is asking for even more, they want five pounds,” he added, referring to a separate contract with SOCOM that was just renewed last month. The Aerosonde runs an electro-optical/infrared (EO/IR) camera during all missions and has room for secondary payloads to run as needed by the customer. The air vehicle has 700 cubic inches in the fuselage that can hold up to five pounds and has 200 watts of dedicated power for one or multiple payloads. Popular payloads include tactical communications, radio relay and signals intelligence, Phillips said, but the new sea-based mission set will bring with it a need for other payloads such as friend-or-foe identification and Automatic Identification System tracking. Phillips said Textron’s work with the larger Shadow UAS – which weighs more than 450 pounds, compared to the 80-pound Aerosonde – has helped generate ideas for payloads that can be developed and tested with internal research and development funding before the military even asks for it. He said the Navy hasn’t asked for things like 3D imaging, orientation and mapping payloads on the small UAS yet, but those have proven useful in the larger Shadow UAS and could be scaled down to fit the smaller system. He did say the Navy has made clear it eventually wants a synthetic aperture radar for wide-area survey, which is included in Textron’s research and development roadmap for the system. Textron operates hundreds of Aerosonde vehicles including in U.S. European Command, U.S. Africa Command and U.S. Central Command. Phillips said the demand for small UAS services is growing and that he is optimistic about his company’s role in land-based and especially sea-based operations going forward. 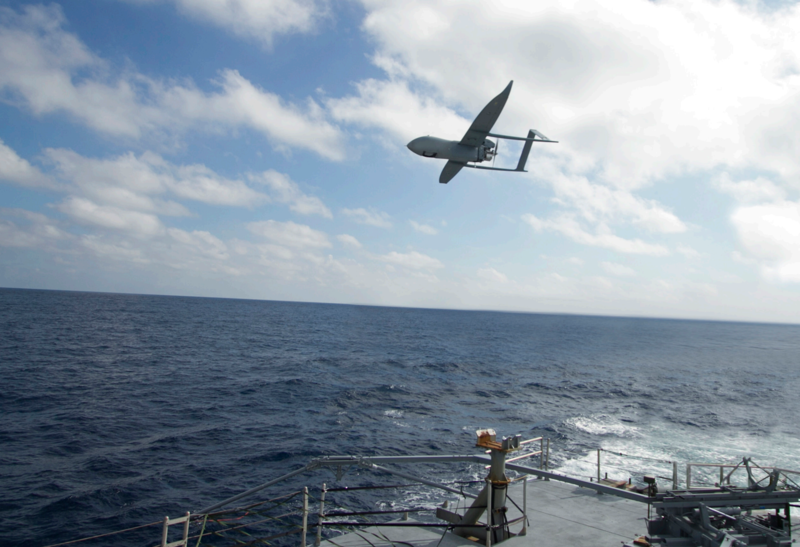 He noted that the previous Navy and SOCOM small UAS contracts both underestimated the requirements for intelligence, surveillance and reconnaissance (ISR)– “in both of those cases they had to get ceiling extensions or ceiling increases” – and said he was glad to see the high dollar value of this five-year contract from the start. “I think what you’re seeing certainly now is larger ceilings under those contracts than what was previously had,” he told reporters.